Here's what I know for certain: there's a big move coming. With the new high on Friday, stocks have reached a critical inflection point which could drastically change the expectations and projections going forward. Since the rally began, I have been anticipating a moderate-to-deep B-wave retracement. If we don't reverse before reaching the price levels outlined below, that prior expectation will be nullified. In Elliott Wave, you must evolve your counts as the market dictates. Just as in life, you must actively change with the changes, or be left behind. Some Elliotticians find a count and stick to it, no matter what the market is telling them... in fact, this is a much easier approach for the technician as he can chart much more quickly each day. If this is the approach you are looking for, then my updates are probably not a good fit for you. My approach is to continually challenge my assumptions each and every day, as new price information becomes available. I then report my findings here. I will strive to communicate when my previous interpretation was wrong, and when the assumptions have changed. 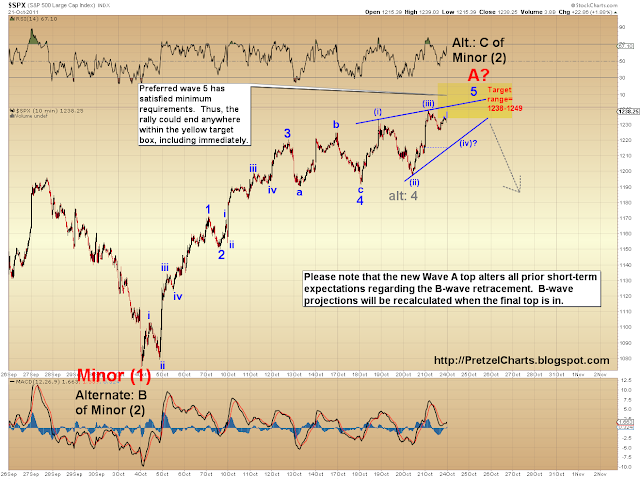 The short-term wave structure presented to us by the S&P 500 (SPX) and other indices has been a challenge to decipher. My best guess, which I presented in the last two updates, was that we had completed wave 4 as a sideways correction and were due one more lunge to new highs, which would then whipsaw. I am still favoring this interpretation. However, time and price are running out for the market to honor this. The best thing about the Dow is that it's very close to the knockout level for this count. Due to the length of the third wave, and the rule under Elliott Theory that the third wave cannot be the shortest wave, the knockout level for this count is 11,993 (11,992.37 to be precise). Thus, we should have a definitive answer on this count in short order. The Dow has completed five clear waves to the upside, so the move up could end at any time... but, based on the one-minute charts, I am anticipating a little more upside to complete the move. Futures are down slighly as I write this, so it remains to be seen. We know which levels to watch on the upside; here are some concrete things to watch for on the downside: a move below the bottom line of the red trendchannel would be the solid warning of a trend change, and a move below the blue Wave 1 high would be complete confirmation. 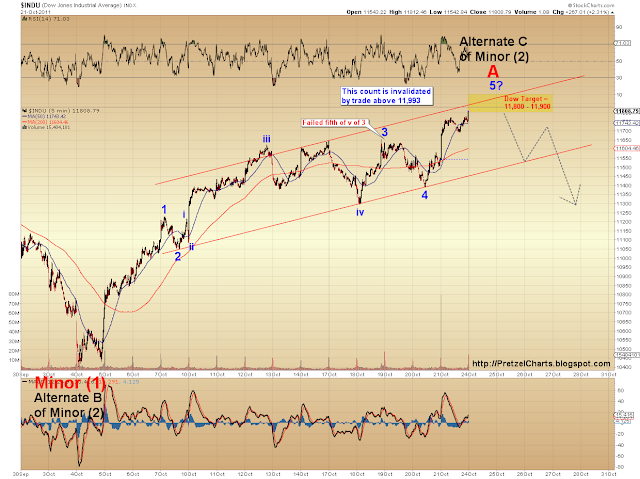 The updated SPX chart is shown below. The labeling on this chart is slightly different than the Dow, and shows a potential ending diagonal, which I first proposed on Wednesday. The ending diagonal may or may not hold true. If we were to label this chart in a similar fashion to the Dow (see gray "alt: 4" annotation), then the ending diagonal becomes unnecessary. So that's my preferred interpretation. I am still expecting a whipsaw here, but the charts are far from definitive -- which is pretty much always the case at tops and bottoms. However, in the event that I'm wrong, I feel it's important to show an alternate, more bullish interpretation. It's probably safe to say that, at this point, most traders believe this rally is going to continue. And it well may. But at this moment, based on my best interpretation of the wave structure, I continue to be of the opinion that this is a fake-out. As I said earlier, though, the good news is the answer isn't far away. If we trade above 11,992.37 on the Dow, then my prediction of a whipsaw will be off the table, and I will have to give weight to the more bullish alternate count. The charts are telling us there's a big move coming. Since we know the levels to watch, the next few sessions should hold the answer as to which direction that move will be. futures are slightly up now. Do you know of a place where I can set an alert for the DOW at the 11993 level? Since the indexes are pretty much led by the movement of the Euro during the trading session (does anyone notice how long this phenomenon has been like this?) Can you do an Elliot wave analysis on the euro? Ugh, Forex. :) Stockcharts gives terrible data on forex, which means I have to screen-shot my account charts and annotate in Photoshop. Beyond that, I'd be starting from scratch, since I've never done a LT Euro chart. It would literally take me several days, and it's hard to find the extra time. Might be a project to work on bit by bit, though. Just went and glanced at it. FWIW, Euro looks due a pull-back to between 1.371-1.382 over the short term. Anon -- Optionsxpress has pretty good "if... then" trades. Not sure if that answers your question. Traditional TA would have a false break of the rectangle to the down side (1075) and revert quickly back inside the box and break the opposite side of the rectangle (up) (happening now) with a target around 1350 area. That jive well with your alternate count. Just don't look at the fundamentals, that's a joke. Oh, and to answer "does anyone notice how long this phenomenon has been like this?" -- roughly since 2003. They're definitely not perfectly correlated, though. For example, during the last bear, the Euro topped in July '08, many months after the SPX; then it bottomed in Nov. '08, months ahead of the SPX. Anon- Yeah, fundamentals are almost obsolete for trading these days. It's all about the printing presses. If the printing presses are determining the rally's, then how can EW predict it? Also I read that the reason for the rally was that the I banks and hedge funds turned on their computer tradings and volume spiked. How does EW which is based on history is able to predict current markets when it is built upon knowledge when these technologies weren't available? just questions that came in my mind, not attacking EW or your work. It's the same reason head and shoulders patterns and triangles still work. Even back in the 20's, the same thing drove markets: liquidity. The market has always been -- and always will be -- liquidity driven. And the herd acts in predictable ways, no matter what or who is behind the liquidity pumps. Looking like I made a pretty good ST call on the Euro earlier... down from 1.395 to 1.386 so far. I count 5 waves down on the dollar to complete C of the second wave, as I talked about Monday last week. Unless there's a fifth wave extension, the dollar may be getting ready to launch here. Gold, on the other hand, looks like it may still be correcting. Only a 3-wave move so far, so tough to confirm or deny at this stage. If the dollar clears 77.79, it should be off the races. Thanks for the concise analysis and clear price signals to watch for. I may be a bit premature by I would say the ED count is dead at this point. Although (as we discussed last week) my preferred count right now is that last week was wave 4 of wave C that began at the 10/4 low (with a failed 5th), the end result would be pretty much the same as your count that last week was the low of wave B. Both counts would suggest a test of the falling 200 day SMA around 1275 is likely, although my count would say that is about the max upside limit and your count would allow for much higher targets. From cycle standpoint alot of similarities to 2007 this year especially for NDX. Both years had a sharp decline after February expiration and an important low around mid-March. Both had a rally into mid-July and then a very sharp decline into mid August. And then in 2007 the NDX rallied into it's bull market top in the final trading day of October and then retested that top in the first couple of trading days of November and that was all she wrote. Will history repeat or at least rhyme this year? My cycle work is suggesting it will. 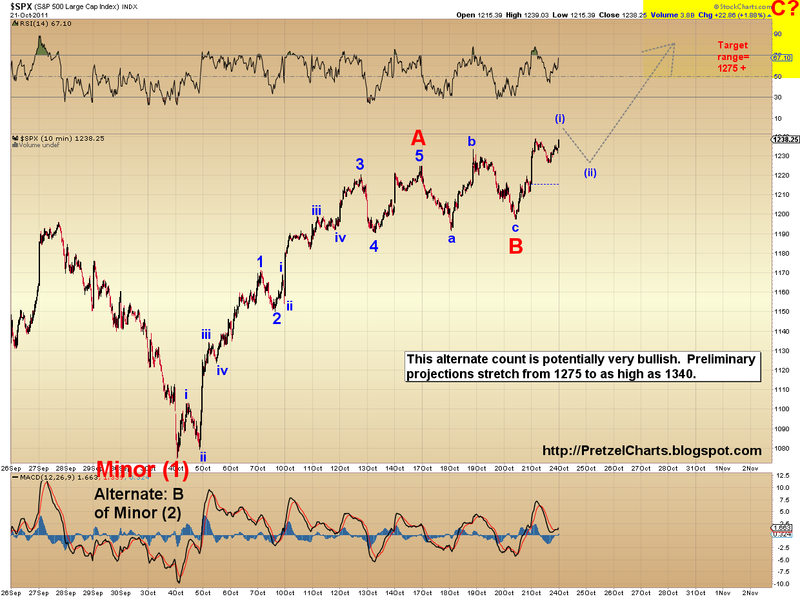 SPX should be finishing this wave right about now @ 1249. I'm expecting it to start correcting here... now we see if the wave it's finishing is wave 5 of A (or C) or wave 1 of C. I believe your count would be 1 of 5 of C.
In the next 2 weeks I have a couple of turn dates which don't specify polarity, they are 10/27 +/- 1 and 11/4 +/- 1... I have been expecting 10/27 +/- 1 to be a high, but if we were to get a blow-off type short covering panic today then I could see that followed by a pullback into 10/27 +/- 1 and then a final rally into 11/4 +/- 1. In fact I am starting to favor that interpretation especially if NDX can break last week's high today. Yes 5 of C is my count, but I think 5 is going to subdivide and today's rally would end 3 of 5 of C... time will tell. I could be wrong, but I would not be too quick to fade this rally today, it feels to me like a trend up day today and possible short covering panic in the making. Yeah, this move off 1074 has been something. I remarked a while back that it reminded me a lot of March '09. I spotted something in the charts this weekend that I'm actually very hesitant to post, but it could blow the whole bear case out of the water. I haven't posted it because I simply have too hard a time suspending disbelief. Sharp eye Pretzel ;-) ... I have been watching the analog to the rally off the March 2009 low somewhat it disbelief as well but cognizant of the fact that we have been tracking almost exactly thus far. If you're still there, I'll post if for you real quick, then I'm gonna delete it. Still there? Hidden in plain sight, maybe? I saw it too... heheh. With money printing press going on in full gear by the Euro zone and the US, I can believe it! But let's see if the bears can defend that 200 SMA line first. I guess I haven't seen that particular interpretation. I've seen people labeling the entire decline as (a), but with (b) and (c) to come. Are we now watching for 1275 on the SPX now? I guess I should clarify. There are plenty of ways to count the market as bullish, but I have not seen anyone consider them yet. The count you showed I have not seen anywhere on the internet, but I had considered it myself. I've had super bull counts waiting in the wings for a while now, but I just can't swallow them at this point, not with this gigantic debt overhang. We would need a Jubilee type event (debt forgiveness on a massive scale) in order to have the fundamental backdrop support the super bull counts. I've got 1257-1261 as next hurdle, then the all important 1275. So we should expect a small pull back before a final launch to 1275 test of the 200 SMA? This rally, you'd have done better just sticking with support/resistance. The Rally from Hell... as I said, reminds me of March '09. Bears kept shorting, waiting for pullbacks that never really materialized. Nasdaq is ripping today. Playing catch up after last week's under-performance. If the bears can't bring it within the next hour I would say we have a major squeeze setting up into the close. NDX is gonna be trouble for the bear case if it breaks the July high... 60 pts away now? Me? I'm gonnna take up spear-fishing, or knitting, or beer pong, or something. Yeah, volume is pretty lame. Still smells like primarily short-covering to me. The lack of volume doesn't surprise me if this is indeed one gigantic short squeeze which my preferred count says it is. The volume will come in at the top when the bears capitulate en masse. March 09 the rally showed very convincing volume early on... This rally - no volume. I am not ready to concede to the bulls yet either. There is one part about the market I don't quite understand: If the majority needs to be wrong and fooled by the market before the market reveals its true move, which makes sense, but doesn't the big money move the market? Doen't the majority have the most money? Or is it really like the wealth gap in general - where the minority has the most money in the market as well? RSI hinting all we saw so far was 1-2, 1-2 and this is 3. I think my labeling of 4 on the Dow chart is correct, CTP. If this is wave 5 of your C count, I think it started on the 20th... otherwise, it's gonna likely be too big. 1261 SPX is gonna be a tough nut to crack IMHO... that is likely where we top wave 3 of 5 of C today. Yes that's where I have it wave 4 bottom on 10/20. No, it's a matter of supply/demand. When everyone is bullish, that means they've already invested -- so there's more supply than demand... nobody left to buy. Conversely, when everyone's bearish, they've already sold, and there's nobody left in the market but buyers. Buyers with no sellers drives prices higher. Yes the smart money is maybe 5-10% of traders but controls probably 90% of the $$$, just like the wealth gap in real world. One other way to count it is if we put the wave 4 low on 10/18 and today is an extended 5th of a wave 3 that started 10/20. After all your call about AAPL making one final e2 to retest the top again may happen? Frank- It could. But Apple has a pretty ugly island reversal top. I was one of those bears who got squeezed hehehe.. Luckily I was only testing this rally with tiny positions and covered today. 1261 SPX should be good for a short trade. Alright, boyz (I guess I'm making assumptions with gender), I gotta split. You're welcome to keep talking here, it's not like I need to be present to moderate or something. Frank, good work protecting that capital. CTP, seems like you've got this one pegged pretty well. per my ideal roadmap would like to see 1261-1267 top of wave 3 of 5, then a couple days pullback that holds above 1240, then final pop to 1275 before bear resumes. Thanks Pretzel. Catch up with ya later. Looking forward to tonight's update. could wednesday be the turn around day? It jives with the structure, which looks like a day or two max to complete... and I'm thinking after the technical breakout from the range, it's going to take a big event to bring out the sellers. Copper ripping today as well. Watch 3.50 area where C=A of an A-B-C corrective flat off the 10/4 low. That would be where bear market should resume for risk assets. Also looking forward to your update tonight. I want to see how things have changed since then but it seems like you're turning less bearish and towards the bull interpretation. CTPTrader can you link us to your chart? More than anything, I just need sleep. This is playing out a little stronger than the preferred count would like, but not impossibly strong. I'll link to some charts later tonight. Tactically speaking I would imagine we are going to get to EU officials playing down prospects for Wednesday in order to simmer down the expectations, so I would not be surprised to see the market pullback and trade nervously into Wednesday after today's squeeze has run it's course. Then the focus should shift the the 11/2 Fed meeting and 11/3-4 G-20 meetings. That is the window where I would expect a major turn coincident with my 11/4 +/- 1 cycle turn date. Aussie Dollar ripping today too, that is the favorite currency for "risk on". I am watching 1.0450 basis December futures as an important resistance area. Nope... it was a leading diagonal. Those tricky bastards. Probably make a run at the 11940's now. All right, I'm outta here. why again is 739 a steel beam above for the RUT? I'm in TZA right now, just wondering if I should hold on or bail at this point. FWIW I am flipping long to short at the close today. I bought SPXU today. Hopefully it pans out. It sounds you both are certain a big move is coming for the markets. Direction is still unclear, but we should know more very shortly. Is it possible to have another big move up after a 17% move in 15 trading days? If the big move is going to be to the upside, what sort of time frame are we referring to (weeks, months, year, etc...)? Rocky- 739 would be IF the alternate count has the correct placement for 1 and 3. The rally is far from crystal clear as to labeling, though, so there's definitely room for interpretation. I'm really looking forward to some nice impulse waves to the downside again... the wave structure is always much cleaner when they're moving in line with the larger trend. Counter-trend is always trickier; as are the major turning points at trend changes, imo. I don't see a big move to the upside from here. I expect we are going to be topping over the next week and the next big move will be to the downside. Now that interpretation may change depending on the character of the next intermediate-term pullback but for now my expectation is ST pullback over next couple days, then one last ST pop to 1275 SPX before the bear resumes. CTP - at this point, if this is A, it would likely have to be part of a massive flat. Anything else, and the NDX blows up the counts. It certainly feels like a C wave of some form; this sure seems like 3rd wave energy. Most likely, it's either C of Minor (2) of the A-B-C alternate count going back into August (shown in black on the above charts), or it's C of the count shown in the last chart in this article... but again, I have a hard time seeing how that count won't blow up the NDX. That whole consolidation mess leading out of August is what makes this a challenge right now. There's no clear-cut form there, which leaves enough question marks to make this rally challenging to position. Even looking at 2007/early '08 analogs isn't much help. The wave structure preceeding that rally was cleaner, and this rally has been much more unrelenting than that one was. CTP, wouldn't a move to 1275 turn up all your longer term cycles? I'm not really a Hurst guy, but that's what my Hurst trader friends are telling me. We're talking short-intermediate term on time frames. And yes, obviously I am favoring the next move as down... but there could be more pain for bears before that happens. Yes I am strongly in the camp that this is the C wave of a Minor 2 flat starting at the August low. Main reasons for that are that it is the only count that can be reconciled with NDX and it also fits with my cycle work. As far as a move the 1275 turning up my longer-term cycles, the answer to that is a bit complicated. Basically I have taken the Hurst methodology and have backtested various mechanical system based off of it. In doing that I only found 2 sub-cycles that could be used to form profitable trading system. The long-term cycles you refer were not consistent enough and to open to interpretation to be useful from my studies. So, in essence that way I use Hurst methods is unique and thus I would not expect to find anyone out there who would interpret the cycles the same way that I do. That said, a move to 1275 SPX would not turn my cycle work bullish. Thanks for the answer. That's pretty cool, actually. Just looking at the NDX chart now. On the 60 minute, you can see a very clear 1-2-3-4, and on the 5-minute, can see 1-2-3, with 4 likely in process. 5 is gonna practically bump its head on the prior high, which would be about perfect. I'm going to post those charts in tonight/tomorrow's update. 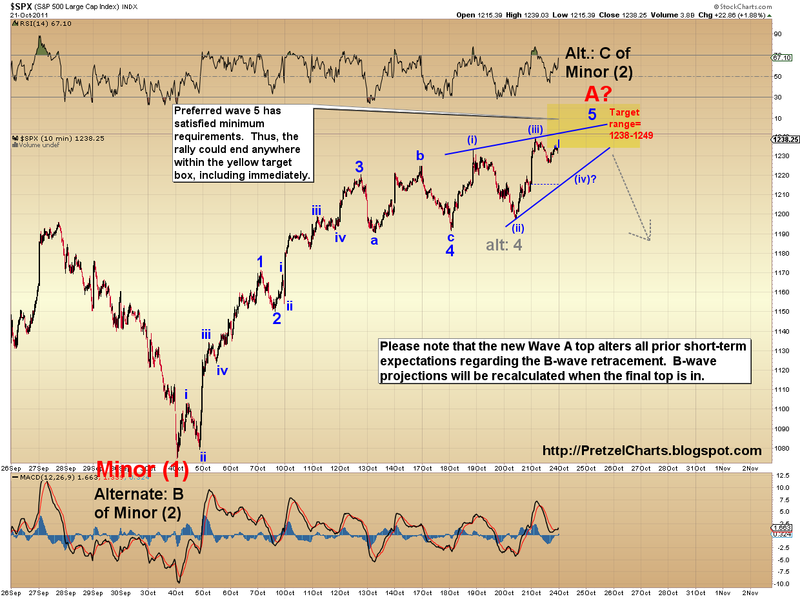 Charting now for tomorrow's update... wait 'til you see the SPX chart CTP. Do you use Gann angle for your analysis? Im guessing the update is tomorrow and not today? what do you think of this count? Working on the update now, and, here in Hawaii, it's still technically "today." ;) 10:30 p.m. here. His count of the correction is very similar to the one I posted in the Weekend Discussion charts. But I'm glad you shared it anyway, because he caught a potential ST triangle in the Dow that has caused me to update the max price to 12,093.50. Vulture, what in the hell are you doing on this ancient thread, lol.